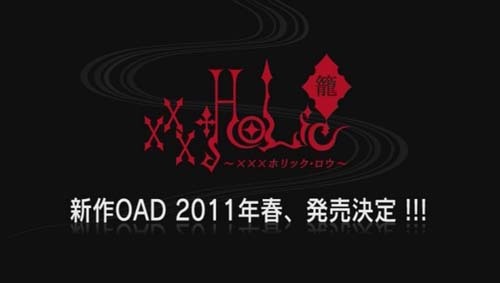 A user from japanese discussion boards 2ch received the XXXHOLiC Rou Short-OAD and reports that a new OAD for XXXHOLiC Rou, expected for the Spring of 2011, was announced in it. Update: The short-OAD is actually the Opening sequence of the new OAD featuring a song by Suga Shikao. 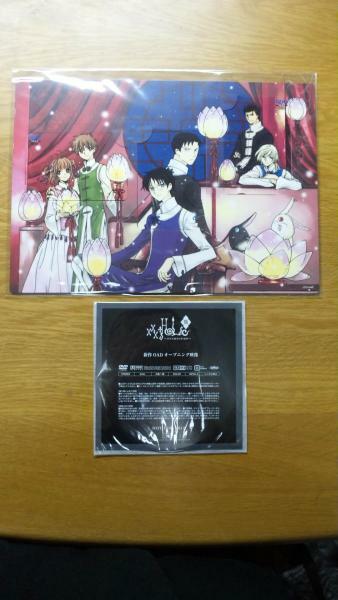 The package says “Opening movie of the new OAD”. And what about this short OAD? Do you already know what is going on there? Bessatsu Shonen Magazine with the first chapter of XXXHOLiC. this is great news! can’t wait!!! >. It seems like they have just started sending out the Short-OADs. I’m pretty sure we will get info about it soon enough =) Not to mention it might get leaked on the web. I-is it confirmed that the short OAD is Holic related? Booo, and here I was hoping with all my might that the short OAD would be Horitsuba related ;___; /dreams are shattered, brb angsting in corner. Yeah, the short-OAD is about XXXHOLiC Rou. More Holic it is then! But we’ll still be stuck with it for a while I’m afraid 😛 The new arc barely started ^^; That said, the more I think about it, the more I believe Clamp should have stuck with their first plan: to end TRC and Holic together. Short OAD = OP to New OAD releasing 2011? Thanks for the info.! xxxHolic news are always good news, and Suga Shikao news are always great news. But put them together and you’ve got one BIG HAPPY Vinheim. Thanks for the video, although that video was extremely dull. I’m kinda disappointed that there will be another OAD since the past ones have been underwhelming (although I did purchase them). Hopefully this one will finish off the story. I wonder what volume this will come with? My guess is Volume 20. I agree with you that this will probably come with volume 20, with volume 19 beginning next month, it will be completed way before Spring 2011.
izit ok to sale precious work to other people?? worry that anyone can take advantage to copy that?.